The highly crafted prototype for the transdimensional manifold array sculptures. 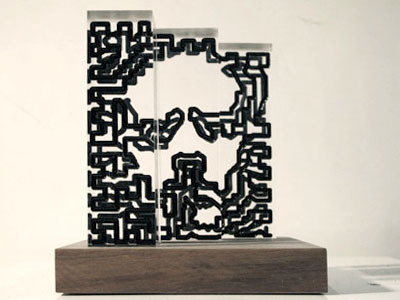 Two labyrinths adorn this triptych monolithic labyrinth sculpture. When viewed from a specific perspective, a portrait image is revealed not otherwise discernible. MAde from hand-milled acrylic.